EDIT by paulirish.. the scope of this ticket it only to fix #2 and #3. the markup in the document will still require the basic html5shiv/modernizr to adjust. this fix will correct the assumption that "jquery is broken" because it cannot handle ajax'd in html5 content and the like. Take a look at modernizr for this, it's kind of heavy to put into jQuery core because everyone would pay the price for it. We've talked about different ways to handle this in the 1.5 feature list. I'm going to open this back up as something we are actively considering. #5327 is a duplicate of this ticket. The major problem is dealing with new elements either ajax'd in or created on the fly... issue #2 of Jon's above. So right now we're looking for a good patch to this. I'm going to bring it up again for 1.7. If we had had a patch for 1.6, it probably would've landed then. #9049 is a duplicate of this ticket. +1, I believe we said we'd try this, but I'm beginning to think we should first try out a plugin. +1, Gain is obvious but what is the cost in size? +1, I would use this a lot. +1, I'm for this and it would be a boon for many, but the problem isn't size - it's speed. We'd need to see a patch and do a lot of perf analysis..
+1, major painpoint for developers. +1, Only if this can be done in such a way that doesn't cripple performance. ​https://gist.github.com/7e1c3c76db44e5a249ff is the general idea. We feature test to see if the shiv is necessary, and we also regex against the input to see if we should even bother shiv'ing it. 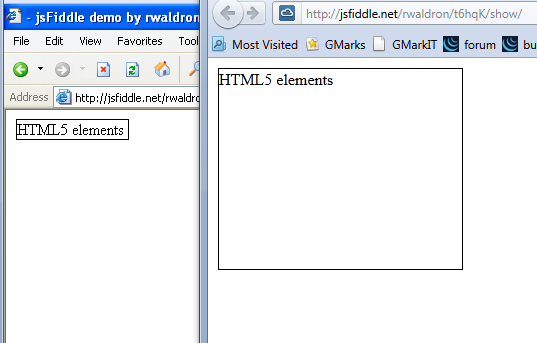 If it is, then we innerHTML it into an on-DOM div and grab the new childNodes which we'll use in a docFragment. But that clearly could be simplified for its purposes within jQuery. does the --- 1) add a node to the dom 2) innnerHTML inside of it 3) pull it off --- trick have a significant hit? is the regex against the incoming string worth it? Talked with jdbarlett about this at TXJS and we agreed the shiv'ing approach within Shimprove ​http://www.iecss.com/shimprove/ is probably a better choice here. Well, actually ​the pastie jon linked in this issue's description has that code in a more readable format. append/prepend/before/after/replaceWith and appendto/prependto/insertbefore/insertafter/replaceAll and wrap/wrapInner/wrapAll ... all use domManip so really only a single code path there should be sufficient. We'll probably want a test in $.support to know if a browser collapses unknown elems. ​The test used in Modernizr would work well. There is an innerHTML set action inside of clean(). Does that collapse unknown elements, or no, since it's still off-dom? unit test coverage and $.support.unknownElems added. Drupal is working on his drupal8 release. 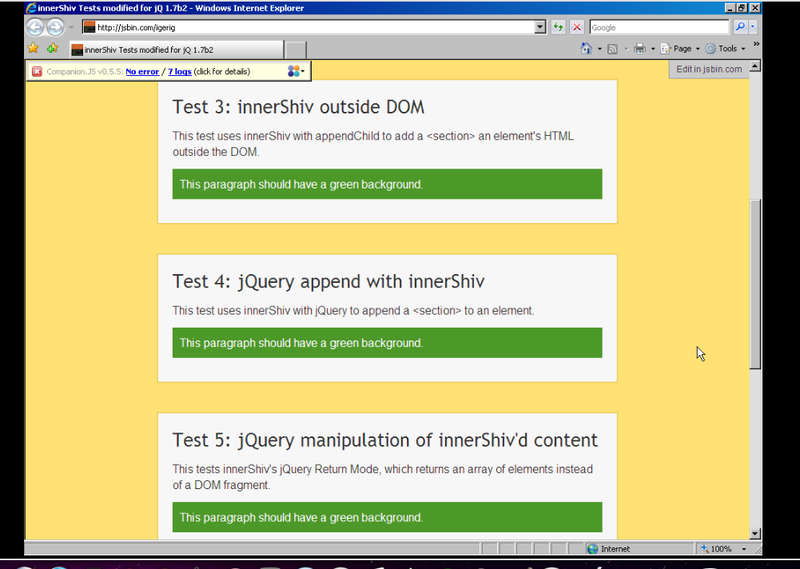 We are planning to include shiv (inner shiv) stuff because we are going to go html5 all the way. BUT apparantly jquery is going to integrate those things for us in their next release. Correct? When will this happen? 3 months? 6 months? a year? I would like to get this info so we can make a roadmap for drupal8. I tracked the bugs down to manipulation.js, within the clean function, specifically where html strings are converted into DOM nodes; the line that reads. This element is used to append the strings, and it's not part of a shimmed document. I successfully experimented by adding the following. Of course, this html5safe fragment could have been previously generated, but for experimental purposes it worked, completely. I ran the unit tests that Paul Irish shared, and loaded up old IE7 and IE8. They passed: 100%. I can take point to integrate that code in jquery style, commit that and PR it. The test suite index.html will also need the basic html5 shiv run on it for some of these new tests to pass in IE. I hope that's okay. #9496 is a duplicate of this ticket. #10283 is a duplicate of this ticket. +1, I just spent a whole day at work figuring out why my code breaks on IE8 and older. It would really help if there was a good solution to this issue. Landing pull request 490. 1.7 HTML5 Support for innerHTML, clone & style. Fixes #6485. #10427 is a duplicate of this ticket. If I may, I think this issue should be extended to really support unknown elements for IE7/8. The problem is that the current implementation has a list of unknown elements. If tomorrow html5 decide to add a new element, old versions of the applications that use the current jQuery version will suddenly stop working until they upgrade their jQuery, and for any new element this list must be upgraded. This approach also doesn't allow custom elements to be created that are not (and will never be) part of HTML5. We are actually using this in an application, where we create custom rendered metadata nodes on the fly (we receive them via AJAX). Elements are things like <loop>, <metatarget>, etc. 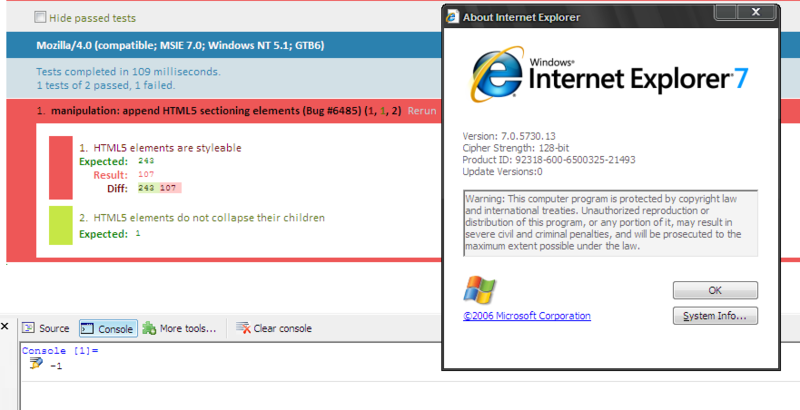 has a different outcome in IE8 than in IE9 (or any other decent browser). I hope you find these requirements acceptable for reopening this, or even better in my opinion reopening the duplicate issue 10427. (since HTML5 support is implemented, and only custom elements are not working). Looking at the DOM tree, IE seems to be recognizing the elements properly, and I can style them if I use class names, but it's not styling based on tag names alone. I'm not at a machine that I can test from, but the first thing that comes to mind is that you'll still need to shiv/shim (whatever) the elements themselves - jQuery has no intention of providing that. Yeah, innerShiv's test page includes Rem's HTML5shim (otherwise none of the tests would pass at all) -- it's actually the test set I used when developing the original innerShiv. jQuery 1.7's HTML5 support is substantially the same technique as innerShiv, which is why it's so odd that this isn't working. Either I've done something really stupid in the test page, or something's going on between the HTML being cleaned and appended that's causing the breakage. HTML5shim is included (line 27 of the source). Line 51 of the source shows the test that's being used. Maybe I'm missing something... I see the same thing in both screenshots. Ah. The section element's background color in the IE<=8 screenshot is red, whereas it's red in the IE9 screenshot. When using a class name as a selector instead of a tag name, the page is styled successfully. innerShiv uses _exactly_ the same technique as the jQuery 1.7 fix, but I've never before encountered this problem with being able to style based of class selectors but not tags, which is why I suspect something's happening between the innerShiv fix and the append. Hope that helps clarify the problem. "The section element's background color in the IE<=8 screenshot is red, whereas it's red in the IE9 screenshot." "The section element's background color in the IE<=8 screenshot is red, whereas it's GREEN in the IE9 screenshot." But anyway. The other demonstration is much easier code to read. Is the cloning issue fixed? 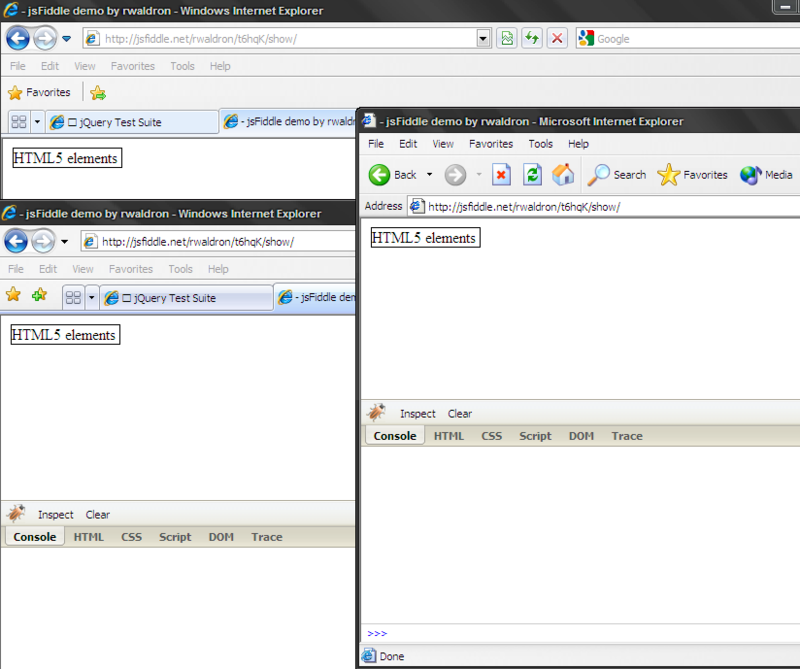 I still get <:section></:section> on cloned <section>s in IE8 (with jQuery 1.7 and html5shiv). I'm using 1.7.1 and I still get the ":"-bug using clone(). Are there any news regarding this bug? This is still happening as of 1.8, anyone have a fix for this they would like to share? I have no idea what "this" you are referring to but I am sure it can be answered better on a forum than on a closed bug tracker ticket. I think 'this' is referring to cloning still not working. I have the same problem using 1.8.2 with Modernizr 2.6.1.